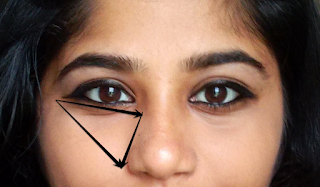 How does it feel to conceal those distracting dark under-eye circle? I use MAC Moisture Select correcter and MAC Studio Fix correcter both in NC45 to offset my under-eye circles. 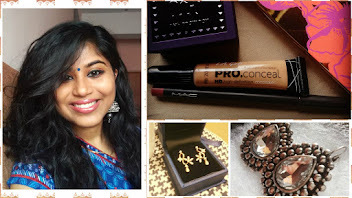 The usual concealing videos on YouTube suggests using a concealer 1 or 2 shades lighter than ones' skin tone, where as I was using 2-3 shade darker/orangish concealer. Orangish or salmon shade concealers are used to correct or offset the grayish tone of the under-eye circles. I did try using a lighter shade concealer, but it ended up looking ashy. If you don't have an issue with under-eye circles, and just need something to brighten up the under-eye, then a shade or two lighter concealer would work. Now what if you need the best of both worlds?, correct and then brighten and top it off with a setting powder to avoid creasing. Warning: This would obviously make you under eye more heavy and cakey though. 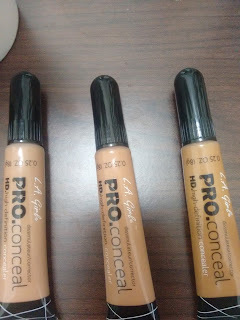 My hunt for a brightening concealer was on, something that would not make my under eye ashy. 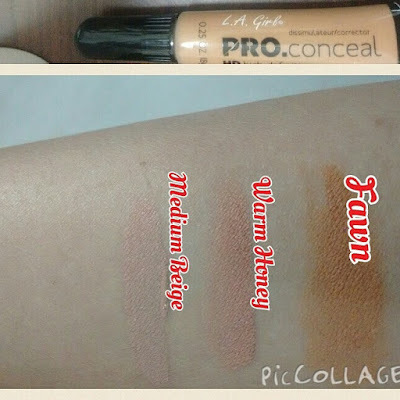 I read lot of reviews and finally decided to purchase LA Girl PRO.conceal, the cheapest, but the best concealer available in drugstore category. I bought mine from BeautyJoint for 3 dollar each and after a moth of going foundation-less, but just concealer, I have decided to write a review. 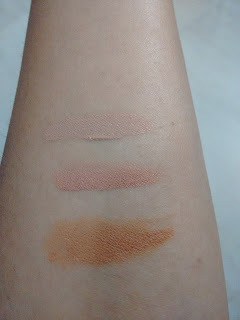 I bought the shades, Medium Beige (Lighten than my skin tone), Warm Honey (My skin tone) and Fawn (Darker than my skin tone). 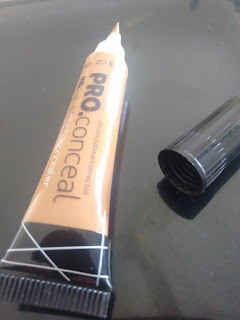 Packaging: The concealer comes in a plastic tube with a brush like tip. 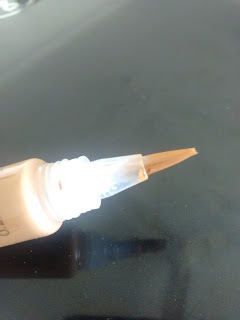 The black cap tightly shuts the brush, and keeps it protected from dust.You have to squeeze the plastic tube, to get product out of your brush tip. You get 0.25 OZ of product for 3 dollars. The applicator disperses product unevenly, and product dispersal is not consistent for all the tubes. Fawn had to be pressed harder to get the product out as compared to the other two. The product comes out through the side of the applicator, making it slightly messy. Product: The product applies evenly, and needs to be blended in the first 3 minutes, because after that it dries out and becomes a pain to blend. It provides, medium coverage and does not settle into fine lines if dusted with a powder. Stays for 7+ hours (humid tropical climate) on my skin (combination skin with slight shininess around the nose area). Application: Apply it in a triangular shape under your eye and blend it in. I use Elf concealer brush for blending. If needed, slightly powder on top.